I'm not saying it was a long and grueling hike, but on the drive home I was hoping we would get into a car crash, causing me to become a quadriplegic so I would never have to walk again. At 13,891 feet, Mount Agassiz is the 20th tallest mountain in California and just 606 feet shy of the tallest mountain in the contiguous United States. In short, it's big. Bigger than you can realize. Having just been boogie boarding on the beach 2 days earlier, I'm not sure that we gave ourselves time to adjust to the elevation. We both felt nauseated at some point on the hike due to either altitude, dehydration, lack of sleep/food, or all of the above. Megan and I are used to being nauseated when we are together but usually it's due to all the bad jokes we make with each other. The hike to Bishop Pass is rather enjoyable, first you go through a forest of evergreens and aspens, then past several lakes, a few waterfalls, steep peaks, and lush meadows. Wildflowers were still quite plentiful, while fall colors were just starting to show. After Bishop Pass came the tedious and exhausting climb up Agassiz. It's not technical, but it is a very long and steep climb over large and sometimes loose rocks. Like the Energizer Bunny, it just keeps going and going but unlike the Energizer Bunny, you can't just smash it with a baseball bat when it gets annoying. You either have to turn around and accept that you are a failure, or keep yourself motivated with the thought that you are legitamately earning the right to gorge yourself at the Sizzler buffet back in town. I mean jesus, does anything really need to be this big? I'm all for a little climbing, but 3 hours straight of rock after rock just to get to the top? Unnecessary. But hey, we did it, and the view from the top is amazing. 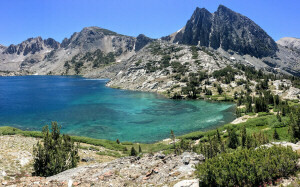 It overlooks the jagged North Palisade peak, the 4th tallest mountain in California, and the Palisade glacier, the southernmost glacier in the United States and the largest glacier in the Sierras. 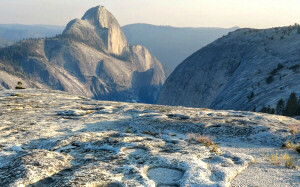 This is a popular area for rock climbing and extreme skiing. All other peaks of the Palisade cirque are technical climbs. Started at 7:15am, summited around 1:20pm, and finished at 7:00pm (12 hours total). 3hrs from trailhead to Bishop pass, 3hrs from Bishop Pass to the summit of Agassiz, 2 hours to get back down, and about 3hrs to get back to the trailhead. 13 miles round trip with 4,136' of elevation gain from the South Lake trailhead. Trail starts at 9,755' and it's 5.5 miles to Bishop Pass (11,960') with 2,205' of elevation gain. From there to the summit is about 1 mile of steep bouldering with 1,931' of elevation gain and a final elevation of 13,891'. The temperature started at about 50F and probably got up into the 60's in the valley (got up to 96F in Bishop). I was quite comfortable in a short sleeved shirt the entire time. We drank 3.5 liters of water between us (probably not enough). This was on a Saturday of Labor Day weekend and while we saw a few people on the trail, it was by no means crowded. We pretty much had Agassiz to ourselves, another pair were coming down as we were going up but those were the only people we saw. It took them 4 hours to get to the summit from the trailhead (it took us 6). Spring flowers still remained but fall colors were starting to show. Left: Interesting clouds to the west. Right: A shallow pool. Spearhead and Long Lakes (Taken by Megan). Left: Mount Agassiz, our final destination. Right: Gaining altitude quickly as we climb the switchbacks to Bishop Pass. Looking back at the valley from Bishop Pass. Doesn't look quite as lush from afar. Once we got over Bishop Pass, things looked pretty bleak, mostly just gray/brown rocks in all directions. Starting the long and steep 2,000 foot vertical climb up Agassiz. Megan climbing away as we gained more and more elevation, while still not feeling much closer to the top. Left: Wondering how much further there is to go (Taken by Megan). Right: Megan taking a break, something we had to do quite frequently due to the altitude/steepness. Still going (Taken by Megan). Finally, the view from the top. It was an amazing thing to come over the final ridge and see these peaks before us. North Palisade is the high point at 14,242'. Snow bowl and lake. It's hard to tell the scale since it was several thousand feet below us but I'm guessing that if there were a person on the shore they would hardly be visible in this shot. Based on measurements in Google Earth, I would estimate this lake to be about 150ft long, or half the length of a football field. You can see the lake in a different state (narrow but about 300ft long) on Google Maps. 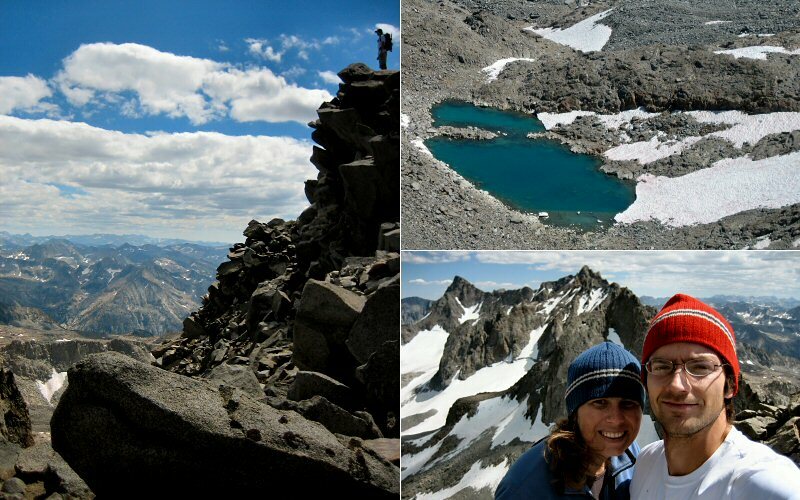 Left: Me below the summit of Mount Agassiz (Taken by Megan). Right: The view from where I was standing. This should give you some idea of what we were up against except this only shows about 40 of the 2,000 vertical feet of rock we climbed over (Taken by Megan). For a point of reference, you should be able to spot the large rock in the upper right corner of this picture in the previous picture of the summit (it's just above center). Me (the white splotch) on the summit (Taken by Megan). The view east. On the left are Second, Third, and Sam Mack Lakes. Mount Sill and the valley below the glaciers. 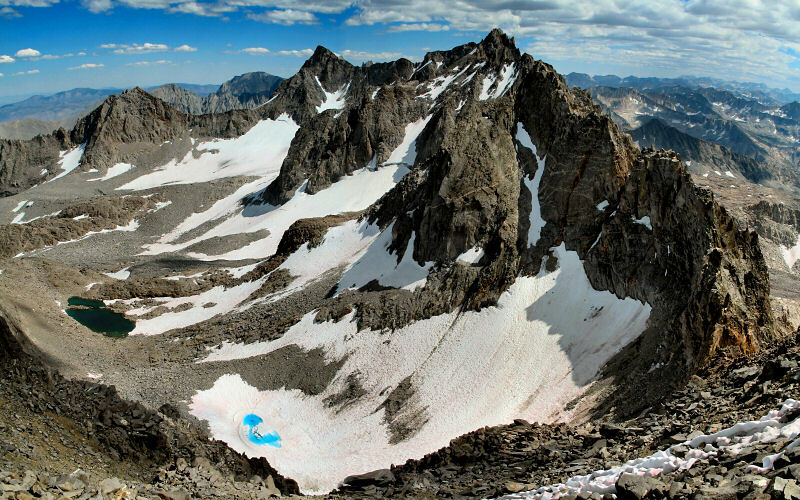 The far glacier is the Palisade Glacier, the southernmost glacier in North America and the largest in the Sierras. Heading back down (Taken by Megan). Left: The shadowy valley far below. 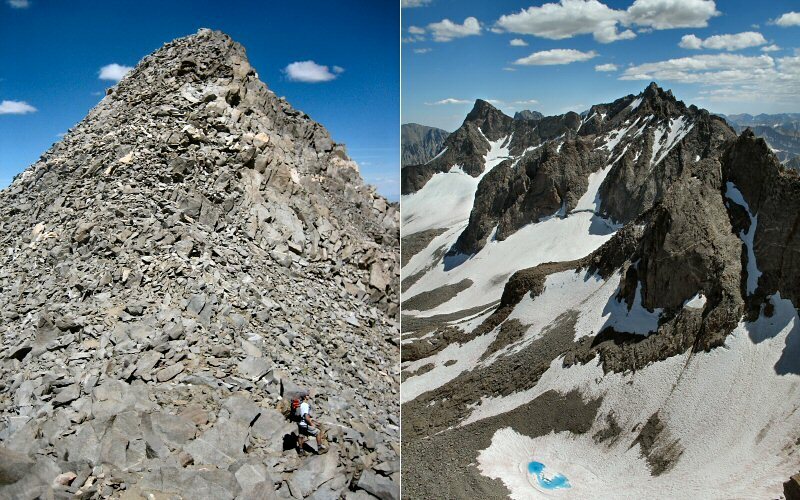 Picture Puzzle is the peak on the right. Right: The lakes. Once down the steep slopes of Agassiz, we took a Clif Bar break and filtered some water from a snow melt pool. Then we made our way back to Bishop Pass, down the switchbacks, and onto the more gradual but long trail back to the car. Loking back at Mount Agassiz, the tallest peak shown here. The route we took up is the far right chute that has snow in it. Megan leading the long hike back to the car. Another shot of Mount Agassiz, hours earlier we were on top of it. Left: Chocolate Peak. Right: Evening setting in at South Lake. The view from near the top of Mount Agassiz. Hiking to Treasure Lakes in the Little Lakes Valley near Bishop/Mammoth Lakes, and driving south along the Eastern Sierra.